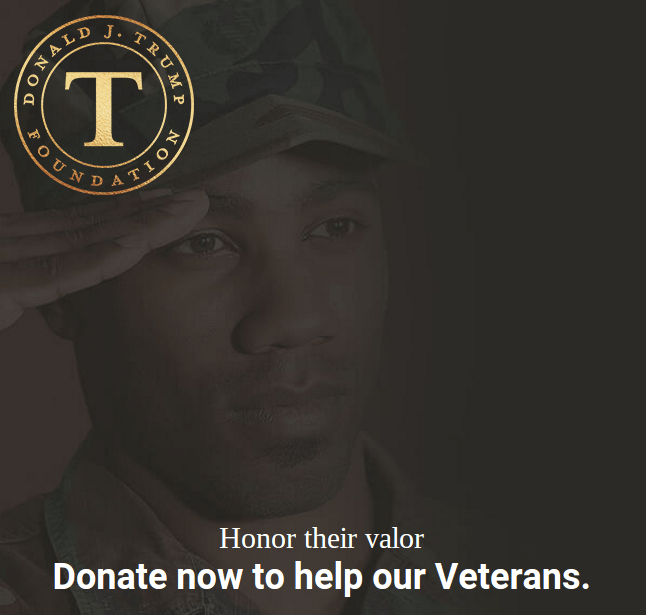 While money raised during an event for veterans was donated to the Donald J. Trump Foundation, it was eventually given to various veterans' charities and not used for his presidential campaign. The donations raised during a benefit event for veterans went to Donald J. Trump's personal foundation instead of veteran charities. Trump putting money he raised for veterans in a personal account from last nights fund raiser. Is this true? He set this page up on the morning of the debate that he skipped, and all contributions went to his personal foundation? What will he sell the American public next? The money raised during a Donald Trump-hosted event for veterans was donated to the Donald J. Trump Foundation. The money was given to veterans' organizations and was not used for Trump's presidential campaign. While most of the leading Republican presidential candidates attended a Fox News-hosted debate in Iowa on 28 January 2016, Donald Trump boycotted the event (as a protest over Fox’s allowing Megyn Kelly, whom Trump felt had asked him “unfair questions in a previous debate, to serve as a moderator) and instead hosted his own event as a fund-raiser for veterans. The Donald J Trump Foundation is a 501(c)(3) nonprofit organization. An email confirmation with a summary of your donation will be sent to the email address provided above. The GOP front-runner, who hosted his own event in Des Moines, Iowa, after boycotting the Republican debate just three miles down the road, announced that he had raised $6 million to donate to veterans groups. Trump donated $1 million of his own money to the cause. The money raised during Trump’s special event to benefit veterans initially went to the Donald J. Trump Foundation, but it’s inaccurate to say that the money ended up in the candidate’s personal account or will be used to fund his presidential campaign. In response to queries over the matter, on 31 May 2016 Donald Trump held a press conference to announce that he eventually gave “close to six million dollars” to veterans’ groups and that the press “should be ashamed of themselves” for asking questions about the money he donated. Trump said he didn’t release the names of the veterans organizations sooner because he wanted to respect their privacy and asserted that the money for a number of these groups had already been delivered some time earlier. Project for Patriots: $100,000 (this “check is check is ready to go” but Trump is still vetting the group, he says, awaiting an “IRS determination letter”. “They have to give us that final document”.